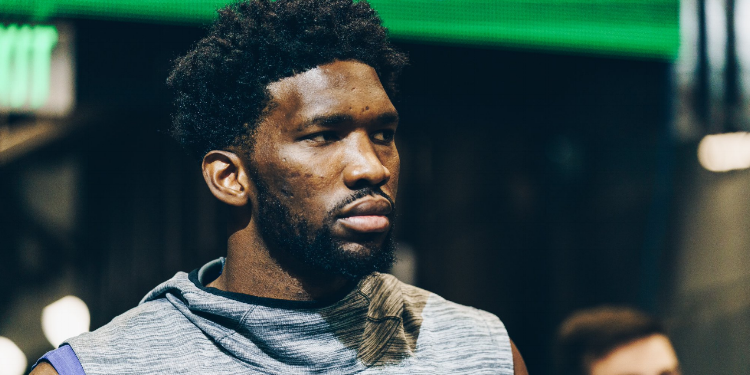 Unterberger: Does the Sixers Losing Even Matter When Joel Embiid Scores 30 Points? The Sixers were generally a bummer last night. Playing in Milwaukee on the second night of a back-to-back, they got off to an early double-digit lead that they promptly flipped in the other direction. They couldn’t guard the rim or the three-point line during the 49-point Bucks second quarter, then couldn’t generate an open look in the half-court during their own 17-point third quarter. Dario looked frustrated. Simmons looked disinterested. Brett looked about 120. They lost their third road game in three tries to dip below .500 on the season. Blame China, blame bench injuries, blame SEGABABA, blame Ersan Ilyasova flop-defecting to an opposing East squad, but the Sixers just aren’t very good at the moment. But then again, Joel Embiid scored 30 and Markelle Fultz hit a three, so maybe it was a win after all. “Embiid is having a terrible game and still has 30-19-6 and is a +9,” tweeted Philly Voice’s Kyle Neubeck with a couple minutes to go in the contest. “Sometimes you just have to shrug your shoulders.” JoJo actually ended up a +3 on the night, and you don’t really need to say “your shoulders” when discussing shrugging (can you shrug a different part of your body?) but otherwise, excellent tweet Kyle. It’s true that Embiid had a subpar night by his standards, a 9-24 FG outing full of aimless post-ups, clanked jumpers and Brook Lopez triples, and it’s also true that he still finished with a box score line to get Marc and Alaa singing “Mercy, Mercy, Mercy”. As he hit that final short hook to round out his improbable 28 to an even 30 -- after being stuck on six for most of the first half -- the agony of the inevitable loss melted into a cool puddle of chill. Things are mostly gonna be OK, probably. Spike and Mike halfheartedly debated on the last RTRS pod whether moral victories are still a thing with this Sixers squad. I generally agree with their sorta-consensus conclusion that they aren’t -- particularly as someone still 999,998 Ws short on my “Sixers will win a million games this year” prediction -- but I may still be a ways from wins and losses being the only (or even the main) things that matter. I still have too much fun with the numbers, still get too excited to check Basketball-Reference for updated PPGs and PERs the day after a big performance like it’s Christmas morning. Wins are good -- I like wins -- but Joel Embiid scoring 30 points in four straight games still makes me unequivocally happy, no further context needed. Of course, the number “30” appearing in a scoring column will have outsized significance for Sixers fans who remember the pre-Process era, when any Sixer posting such a total was worthy of a Wilt Chamberlain photoshop, and no doubt required an Earl Watson-like preponderance of fouling and force-feeding to achieve. During the Doug Collins era in particular, a 30-point scoring performance was practically an Ayn Randian expression of individuality within the Sixers’ near-socialist team framework. In fact, Embiid’s four-game streak matches the total number of such outings notched by every Sixer combined from the 2010-’11 season to the ‘11-’12 season. It feels gaudy, shameful, egotistical. It also feels natural, beautiful, right. Embiid going off for 30 a night probably shouldn’t be that surprising at this point. There’s at least one run in every game now where it seems like he should be able to add at least one point to his total every time he touches the ball, where when he scores you wonder how any different outcome was ever even possible. Plus, as Doris Burke, Jeff Van Gundy and the woman who asked what kind of salsa you wanted with your Chipotle order have all informed you within the last 24 hours, scoring is up all around the NBA -- and indeed, Joel’s 29.6 PPG ranks him a mere sixth in the league at this point. Finishing with a cool 30 like his name was David Simon maybe isn’t that big a deal for JoJo in 2018. It seemed like a big deal last night, though. As previously suggested, this wasn’t even a particularly good Embiid performance -- it was clunky, erratic, lacking in memorable punctuation. It was a lot of free throws and hard-manufactured buckets inside. If you were watching the game on mute without a running tally in your head, you’d probably assume he was was still mired in the low teens by the time he hit a second three to bump his tally to 26. Even on an off night now, Joel is dominant. And it feels like we’re still only scratching the surface with him. And naturally, it also needs hammering home that last night was the second road game of a back-to-back, following a grueling overtime loss in Detroit. Last year, the Sixers would’ve left JoJo in Motown, padlocked in a gigantic bucket of ice. This year, he went to Milwaukee, gassed up on cheese curds, played 36 minutes and ground out 30 points. And it wasn’t a controversy, wasn’t a story, wasn’t a thing. It was just a tough loss to a good team where the Sixers’ best player was at a 7.5 instead of a 10. This was all we ever wanted, really. Will there come a time when the sting of a Sixers loss can’t be undone by a couple pleasantly round numbers in the box score? It’s possible. Perhaps the downside of winning at the highest level is that suddenly, winning at any micro-level ceases to be its own reward. Until then, though, it still matters when our most important players hit arbitrary totals to mark meaningful points of progress in their career trajectories. And while I’ll be gutted if the Sixers don’t turn things around on Saturday against the Hornets, if Joel posts a ho-hum 32-16-5 in the process of the crushing loss, I can probably deal.